The memorial tablet commemorates those from the 47th Infantry Battalion who died in service or were killed in action during World War One. It is a wall tablet of Australian marble consisting of two bronze tablets. 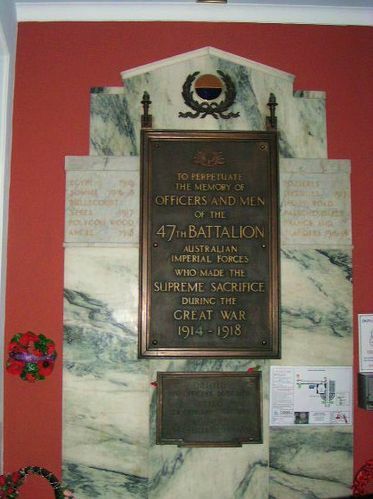 Above the tablet, within a bronze wreath are the battalion bronze colours. A special meeting was held in ANZAC House, Brisbane in August 1932 to decide on the successful tender for the memorial tablet. The successful tender was Messrs F Smith & Son of Ann Street Brisbane. The memorial was designed by Mr. A.F. Brooks of Brisbane. At the meeting the Committee had been informed that the Governor would unveil the memorial on the 11th August . Morning Bulletin (Rockhampton), 8th August 1932.